Content/ Trigger Warning: Self-harm and blood-letting is central to the magic system and happens often and throughout the story. Okay, this review might be messy, so strap in. I spent so long agonising over how to rate this book! This one one of my most anticipated books of the year and I have very, very mixed feelings and, I suspect, some unpopular ones. It’s a book of two very different parts. I struggled with the beginning of the book. Really, really struggled. To be honest, if this hadn’t been an ARC for review, I’d probably have DNF’ed the book. The plotting is slow. Very slow. Despite blood-shed, angry gods and a protagonist on the run. Somehow, it still feels slow. The world-building feels messy to me. I have no problem with the blood-letting magic system (although, as above, this is something to be very aware of. It’s not one-off, but throughout the book and central to the story). However, I don’t feel like it was ever really explained very clearly. How are the spells created and written down, why does blood activate them, what’s the education system for learning? The politics (both between the warring countries and within the Tranavian court/ government) was the same. I didn’t feel like there was anything happening beyond what was going on with the two or three characters in that very moment. There wasn’t any real depth to the world beyond them. Similarly, the characters were very two-dimensional for much of the first half. I still don’t feel I know much about Nadya as a person, her personality is never developed. Of all the characters I thought that Serefin was the only one I really felt a connection to, and even then it took a long time to get there. However — and it’s a big however — the book started to pick up around the second half: once Nadya and the others reached the royal palace (although it wasn’t until almost the three-quarter mark that I felt really interested and invested in the book). Around this point in the story, the plot took a couple of sharp twists and the excitement really amped up. I really, really liked this last section of the story (the third act, basically). I wish the book had started at a later point in the story. The entire first half have could have been cut down and it felt to me more like padding so as to make the story run for a full trilogy. 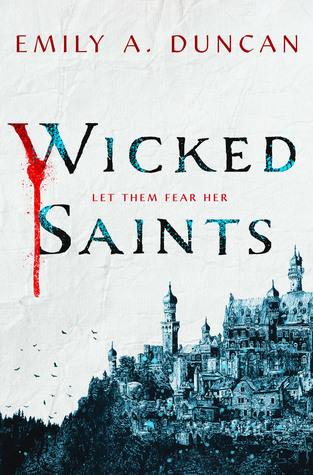 I’m curious whether Wicked Saints would have been stronger as part of a duology. That aside, I can’t say much about this section without giving too much away (since it’s right at the end) but I really did think the last 20% of the book was really good: full of action, surprises and character moments. Which brings me back to: I spent so long agonising over how to rate this book. 3-stars is a compromise. I’d rate the last part much higher (4 to 4.5 perhaps?) but the first part was so slow and poorly developed I just can’t go any higher. I just can’t justify trawling through 75% of a book before it becomes worth reading. The ending is great and, weirdly, I think I’d actually still pick up the second book because now I’m interested. I just don’t think it should have taken 300 wasted pages to get there. I rated this 5 stars, and yet I actually agree with basically all of this 😀 I didn’t REALLY struggle with the first half, but it definitely picked up later. I think it’s a trilogy because each of the three characters has a book, which is… if this was Nadia’s book, that’s kind of disappointing, because while I liked her, I agree that she was kind of flat? I don’t know. I don’t think she completely lacked personality, but if I have to rank the three mains, she’d come 3rd. I’m really, REALLY glad you came around on Serefin though.